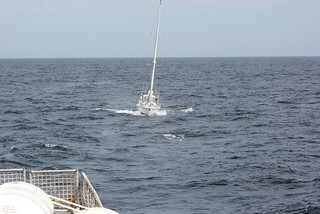 BOSTON — Coast Guard search and rescue crews are towing a disabled sailing vessel about 80 miles east of Cape Ann, Massachusetts, Saturday. Watchstanders at the Coast Guard Sector Boston Command Center received notification of a 46-foot single-masted sail boat that suffered a disabling engine failure with two people aboard. The Coast Guard Cutter Escanaba, home-ported in Boston, Massachusetts, diverted from patrol, arrived on scene, brought the two passengers aboard, and took the vessel in stern tow. .
Once closer to shore, the Escanaba crew is expected to transfer tow to a commercial towing company at about 1:00 a.m. Sunday in Plymouth, Massachusetts.